The first time I ever had a vegan tofu benedict was at Champs Diner in Brooklyn a few months after first going vegan. This was a time when I knew nothing about cooking and had no idea how amazing vegan food could potentially be. When I tried their tofu benedict I was amazed by how much it tasted just like the eggy vegetarian versions I remembered having before going vegan. It was the ultimate filling, comforting brunch food. Back then, I remember thinking that gourmet restaurant-style vegan food was something I'd only ever be able to enjoy at restaurants because it would be way too complicated to make from scratch. Over the years I've since learned just how easy it can be to recreate some of my old favorites and began experimenting with my own version of this classic brunch recipe. Traditional eggs benedict includes ham and this was also true of the vegan version at Champs, but I've always found faux meats unappealing and also not very healthy, so I chose to leave that out of the equation. I also decided to go with a less traditional almond flour and pumpkin biscuit instead of using regular white flour, which adds a nice autumnal twist and makes these biscuits much healthier- and they're also gluten-free! 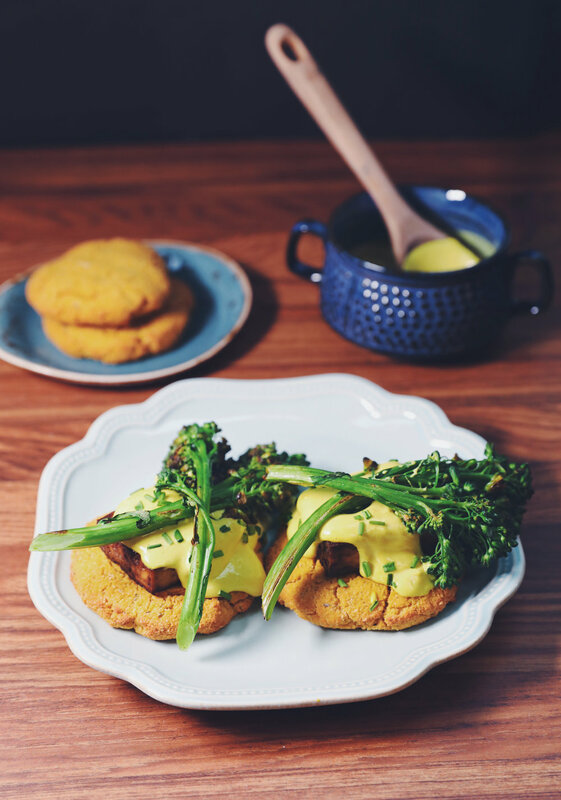 On top of the biscuits, I stacked smoky baked tofu, followed by a creamy, buttery cashew hollandaise sauce. This recipe is a little nut-heavy with the almond biscuits and the cashew sauce, so it's not going to be the healthiest everyday kind of meal, but it's perfect for serving brunch guests or having a fancy sunday breakfast. While it is higher in fat than most of my recipes, it's still oil-free and contains plenty of fiber to keep your gut flora happy and thriving. My favorite topping for this recipe is usually pan-seared broccolini and fresh chives. The broccolini adds a great crunch and texture to the dish, but I have also had some success with using sauteed spinach and layering it underneath the tofu rather than on top. I'd still recommend trying this with broccolini if you can find it though! Regular broccoli won't work for this recipe as it's too thick, so if you can't find broccolini (the long skinny version of broccoli), spinach is the way to go. This is my favorite recipe to serve guests, not only because it looks so beautiful, it's also shows how delicious and filling vegan food can be. While there are many parts to the recipe, it's a lot easier to make than it seems at first. Make the biscuits, bake the tofu, blend the sauce, sear the broccolini, and then assemble & serve. I promise the time spent is well worth the effort!